Beach Access at Westcott Bay Waterfront Retreat. 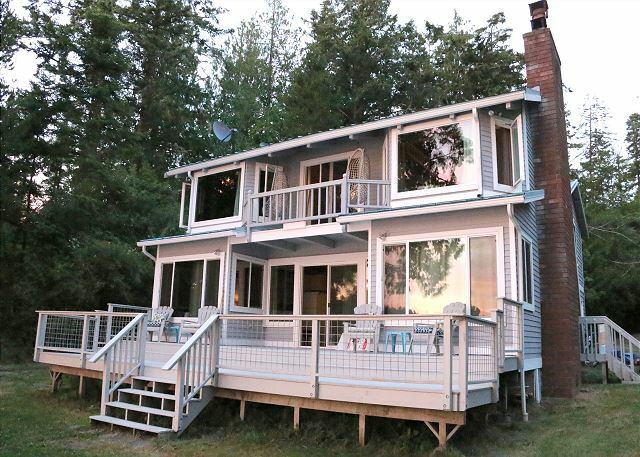 This spacious cabin boasts a giant waterfront deck on the main floor and a small balcony-deck off one of the upper floor rooms. Huge picture windows and sliding glass doors monopolize each cabin wall that faces the bay in order to take full advantage of the stunning view. 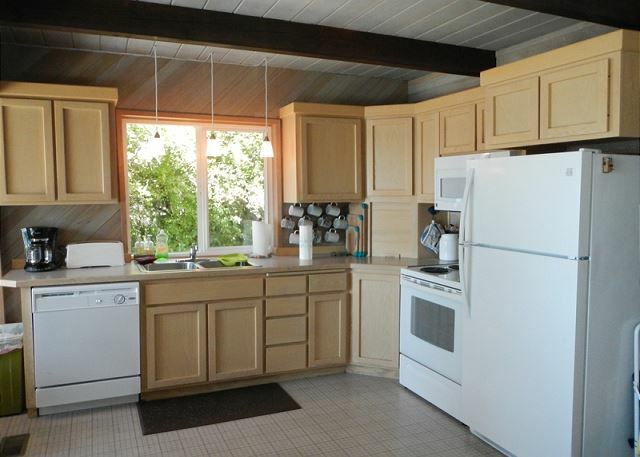 The open concept living space on the main floor includes a small, well-equipped kitchen, which has recently been updated with all new appliances, including a dishwasher, electric range, microwave oven and refrigerator. In the center of the main floor room is a dining table that will accommodate 6 people maximum. A gathering/conversation space at the far end of the room is equipped with a futon couch, two comfortable chairs, a cozy fireplace and an armorer that houses a newly installed flat screen Smart-TV. The cabin is equipped with wireless internet service, DISH Network satellite TV and a DVD/VHS video player, as well as an assortment of movie titles for our guests to choose from. There is a full bath on the main floor, with two sinks, and a bathtub/shower. The back hall of the first floor has a small stackable washer and dryer. At the top of the stairs on the second floor, you will find a charming, master bedroom with an en-suite half bath, a queen-sized bed and a very large bay window alcove with a spectacular view of the water. 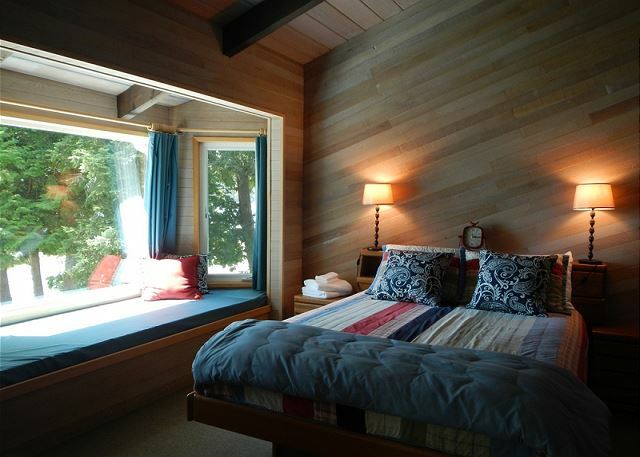 Adjacent to the master bedroom is a large room with the same bay-view alcove window sitting/sleeping area as the master bedroom. 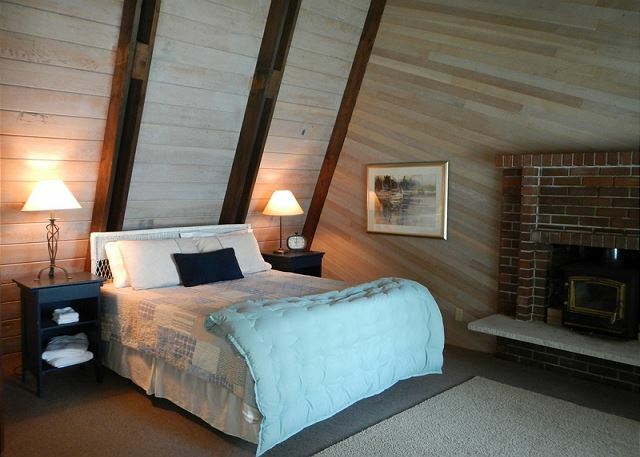 This room has also has a queen sized bed, and a small wood-stove fireplace. 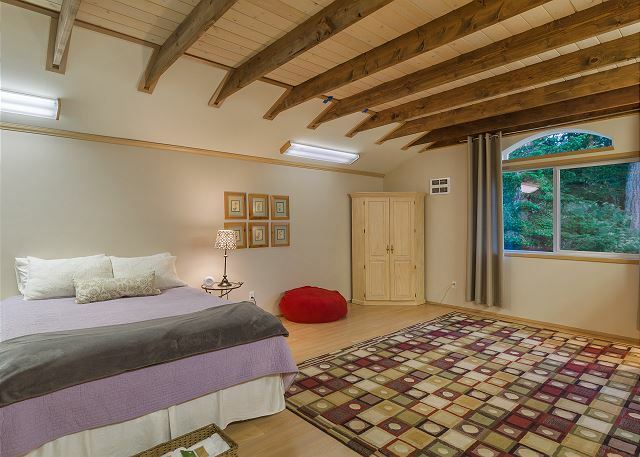 Both rooms feature rustic, vaulted beamed ceilings and cedar-lined walls. 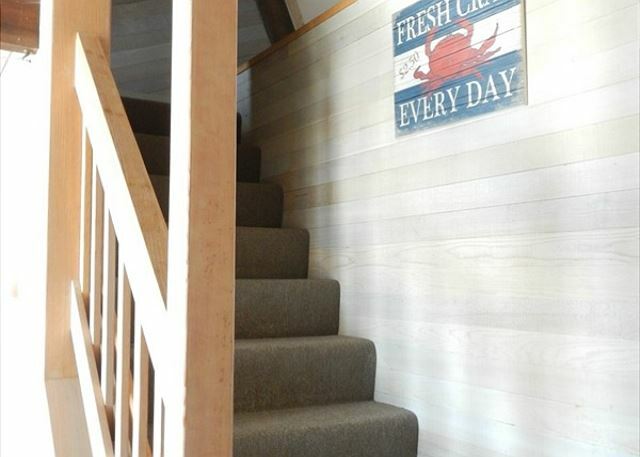 If you turn right at the top of the stairs, a unique “skywalk” connects the original cabin to a recently added bonus room. Depending on the makeup of your group, this spacious room can serve as a private second master suite, or as a large room for the kids. The bonus room is furnished with one set of bunk beds (2 twin beds and one full bed). This room has a full bath with shower and an armoire with a TV and DVD/VHS player. 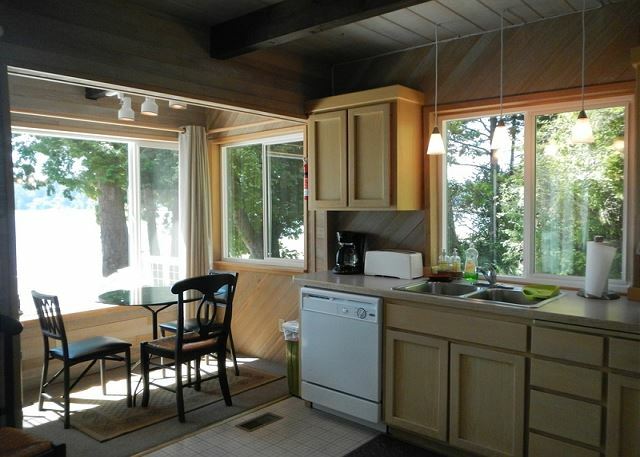 Outside the cabin, there is lots of level grassy space to accommodate a variety of recreational games or activities. There is plenty of room to play badminton or croquet, or just practice your golf swing. 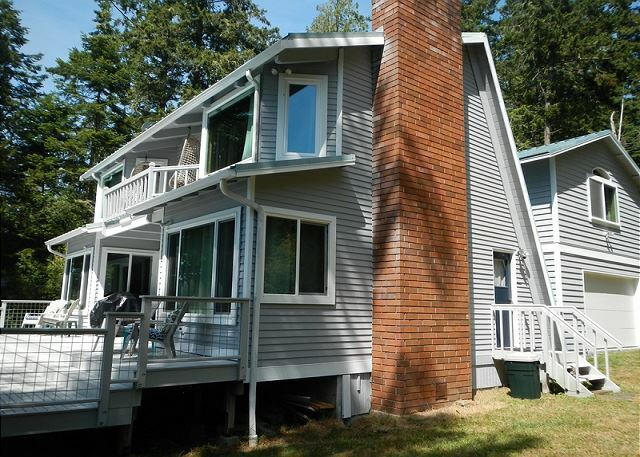 Westcott Bay Beach Waterfront Retreat is just a 5 minute drive, or about a 20-minute walk from scenic and historic Roche Harbor, which offers restaurants, a small grocery store, and a variety of shops and tourist sites. Because of some of its unique plant life, Westcott Bay is one of the few environmentally protected bays left on San Juan Island. That means the bay has no commercial marinas, making it free from major boat gas and oil pollution. This is one of the reasons Westcott Bay is one of the leading producers of clams, which are abundant and easily obtainable when the tide is out. There is a commercial oyster farm at the end of Westcott Bay Road within walking distance of the cabin, where you can purchase freshly farmed Westcott Bay oysters! Another unique characteristic of this property is that you are just down the road from endless amounts of trails to hike in the National Park of English Camp. 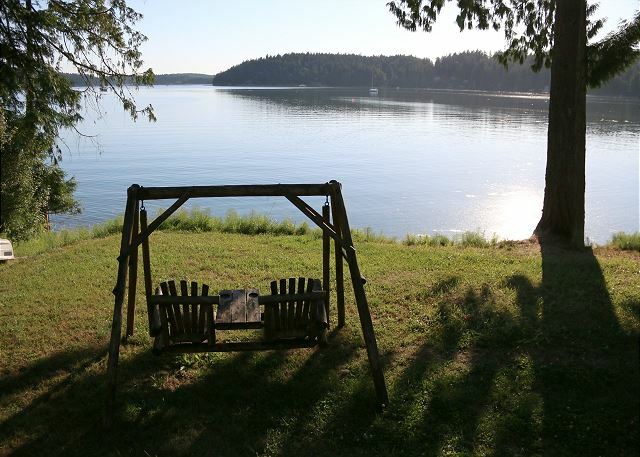 Visitors are very likely to see other local wildlife from this property, including, bald eagles, deer, foxes, otters, pelicans and owls, to name just a few. 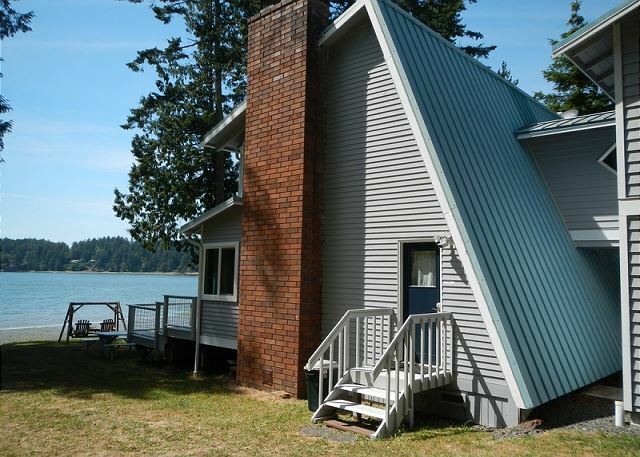 Come and enjoy this relaxing, well equipped cabin on Westcott Bay. We had a lovely time, and the home was very comfortable. We cooked meals there and the kitchen had absolutely everything we needed. We slept well and certainly enjoyed the view. Just 2 things you might consider: easier access to the beach & maybe some binoculars. Probably walking to beach is fine in the summer but was very muddy in the grass. I understand it had rained a lot prior to our visit. It is a beautiful spot! 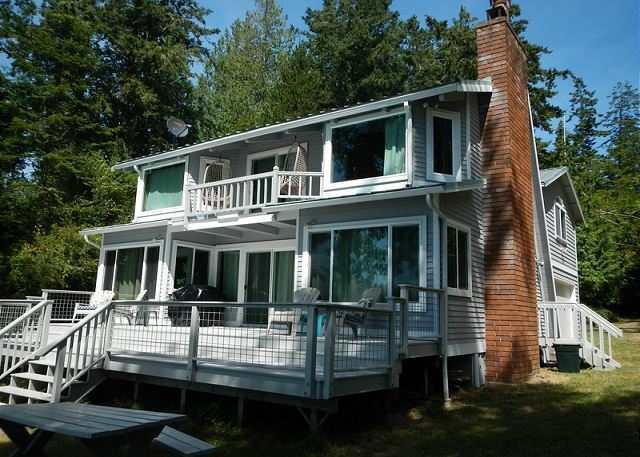 Every year my daughter and some of her friends and I visit San Juan Island and stay at this comfortable and roomy house on Wescott Bay...minutes from all the Island has to offer. We BBQ (provided) at the house and the kids sit out on the beach and talk snd build friendships. Great times...great house to rent. This quaint cabin is a place we will definitely come back to! The home was clean and well-stocked with everything we needed for our stay. The bay it faces is full of sealife and birds and is beautiful to look at. Definitely with every penny to stay here! My family and I had a getaway during Memorial long weekend. At first, I was quite worried about the location and its conveniency since I had never lived far from the Friday Harbor ferry terminal. But the location turned out to be a perfect spot for us. Rocher Harbor is very close to this rental place so we could go to the market over there to get what we need. Also, i like the access to the beach. We did some clam and mussel digging, and we also brought our own floats. This is the perk of having a waterfront house, I would say. I love the tranquility this place has to offer. would love to visit again & stay longer. Only two issues I have. One being the upstairs toilet continually ran, the other, the water needs a filter on it as it tasted like chlorine. I'll bring my Berkey filter with me next time. We had a great time at Westcott Beach Waterfront Retreat. The house was clean and comfortable. The shower door in the main floor bathroom was off the track when we arrived and the property manager was friendly and prompt in fixing it. It did still need "kidd glove" care as there was a tendency for it to jump the track whenever opened or closed. This might be something to replace soon. The deck was great and we were entertained by the ever present bald eagles. The sea otters were fun to watch and there was even a small fox that, much to our surprise, joined us for appetizers and wine one evening. My family and our inlaws met cross-country to enjoy spring break. This was our first time renting a VRBO, and we couldn't have been happier. The house is stocked with the esentials, the price was right, and navigating the whole process a breeze. They email you directions, ferry information, ect. This was such an awesome experience, and we look forward to returning! Oh! And we saw the seal! Make sure you bring your muck boots for optimum beach experience. the home was nice. the house had a lot of beds. The only problem was the door knob to the downstairs bathroom would not work properly. The house is beautiful and all of us thoroughly enjoyed our stay. We were pleased to be able to launch our kayaks from the house's beach too! Fun home, worked out great! I rented this for 3 couples in their late 70's to early 80's. They loved it, plenty of room, the only thing I heard in the negative was the stairs up to the bedroom area were a little narrow and challenging ( for them). 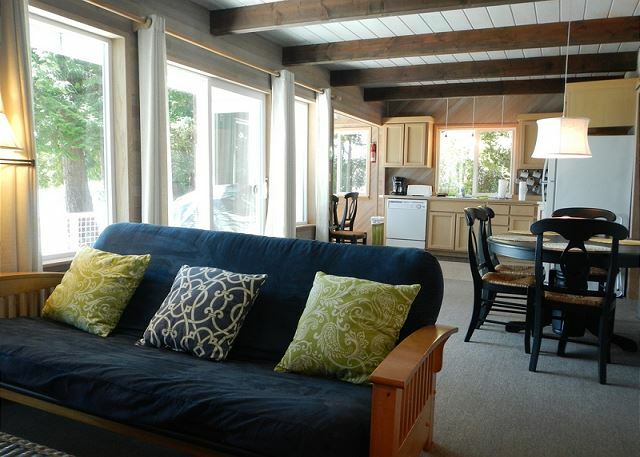 My family with three small kids stayed four nights at Westcott Beach Waterfront Retreat. It is a wonderful place! The house and property were clean, private and quiet. We loved watching the sunset on the front porch. We saw a seal visit the bay every day we were there. We would stay here again! We loved driving down to south beach and spending the day playing with rocks and sand when the tide was high at the house. Friday Harbor has a lovely place for kids, an indoor play area called A Place For Kids to Play! It was great on the rainy day. The Management company was a breeze to book with and very helpful. The home we stayed in was clean and beautiful. It was a lovely place for a quite vacation, yet so close to both ports for whale watching, kayaking, etc. It was great!